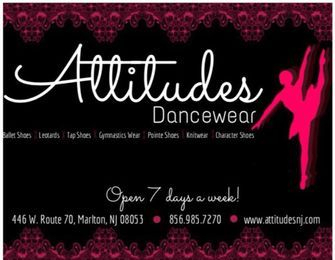 Visit Attitudes in Marlton, New Jersey, to see our extensive selection of dance apparel and shoes. They are conveniently located on Route 70. Make sure Attitudes knows you are an SSDS Dancer. 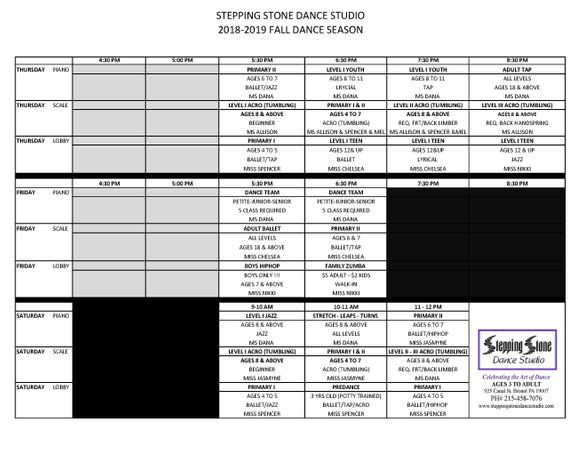 Stepping Stone Dance Studio with Ms. Trina. Private lesson includes voice & acting lessons and audition prep. The Lesson slots are a predetermined time – 30 minutes. If you are late, there will not be added time on to your lesson. Cost is $25.00 per 30 minutes. Must register for a minimum of 5 private sessions. Total $125.00. ​Please always bring a 3-ring NOTEBOOK, PENCIL and WATER to your lesson. Please provide 24 hours notice for lesson cancellations. We understand emergencies and sudden illness. Please plan schedules around our time together and request adjusted lesson times accordingly. Illness: YOU CAN SING WITH A COLD. YOU CANNOT SING WITH A SORE THROAT. Both those things said, unless a student has a fever or they are contagious, please come to your private lesson. We can do other things (work on character development, music theory, ear training, etc) while they are sick. If they can go to school, they can come to private lessons. Private voice lessons allow each individual to begin or further their singing abilities. Private voice lessons include study in posture, breath support, tone production, vowel placement and diction. You will learn how to balance and blend all of your vocal registers, how to support your voice effectively, and to build power in your voice. These skills are then applied to song literature, with songs chosen based on each student's age and ability. Additionally, students may work on musical theater audition preparation. Private study builds vocal technique and musicianship, while instilling self-confidence and independence in the student. These lessons will help develop the skills needed to successfully represent yourself during an audition! We encourage our students to build upon the fundamentals of acting technique, including identifying acting beats and character motivations, script analysis, and how to be present in the work. Additionally, students will learn how to confidently present themselves in a professional setting, develop contrast in their audition package, and choose material appropriate to the type and style of the audition. 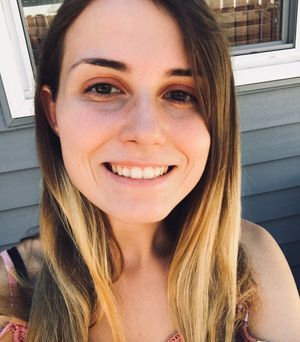 During this training, a great deal of time and energy will be spent in discovering the types of songs that are both necessary to show your versatility as a performer, as well as the songs that fit the types of roles you can actually play. This has to do with understanding the types of characters you will be best suited for. We take a great deal of time in developing your ability to discover, integrate and communicate the character, emotions, motives and back-stories inherent in all the songs in your repertoire. You will be challenged to find a perfect and dynamic balance between technique and emotional impact in your performances. This intensive work will pay huge dividends when it comes time to audition for shows and performances. Kid’s creativity is nurtured and flamed by creative movement. Self-esteem is boosted by performance experience, especially by dance recital productions. Acrobatics is a starting level for ages 4 and up to help in the development of individual strength, stretch, and confidence of each child. Students will learn floor work integrating tumbling skills (forward and backward rolls, cartwheels, limbers, back walk-overs, front and back handsprings, and aerial to name a few) with dance movements. This class encompasses fun learning activities and exercises to spark creativity, imagination, coordination and socialization. Dancers gain poise, grace, self-confidence and discipline of the mind and body. Stepping Stone Dance Studio has implemented the Acrobatic Arts Syllabi Program. The program is broken into four levels of Acrobatics classes designed for dancers to diversify their performance skills. Primary I & II, Beginner, Intermediate, & Advanced. This class is a fun, energetic and structured acrobatics class for young children. In a playful age-appropriate way we will work on basic acrobatic skills starting with proper hand positioning, forward/backward rolls and beginning handstands that will lead towards cartwheels. Classes include a fun energetic warm up and lots of creative games that will help improve your childs motor skills. While working physically on balancing, core strength, flexibility, and technique the childrens listening and understanding skills will improve in an exciting way. This class is suitable for boys and girls from the age of 4 to 7. This class is intended to provide dancers the chance to become acquainted with basic tumbling and gymnastics elements. This class will enhance students? kinesthetic awareness and boost their overall confidence to perform more difficult skills in the future. Some elements students will learn include basic body positions and jumps such as a tuck, pike, straddle, forward and backward rolls, bridge, cartwheels, round offs, back bend, front/back support holds, balance exercises, headstands, tri-pods, and handstand against wall. This class combines tumbling elements with combinations and strength conditioning to increase our dancers learning rate when they are introduced to new skills. At this level, students will add elements such as kick overs, front/back walkovers, side/switch leaps, Nip ups, front handsprings and side aerial basics into their acrobatic repertoire. Dancer must be able to kick over & stand up from a back bend and go into a back bend on their own. Once the basics have procured along with strength training, the sky is the limit in Advanced Acrobatics. Proper body alignment, balance, flexibility, strength, and kinesthetic awareness combine to allow serious dancers to bring their technique to the next level. For maximum results, intrinsic motivation and determination is needed. Students in this level will work on skills such as single/multiple back handsprings, front/side ariels, back tuck, and layout step out. Dancer must be able to do a front & back handspring on their own and/or light spot OR back Arabian & back handspring with a light spot. Will need light weights & stress ball for this class. NOTE: Levels for Acrobatics classes are solely determined by skill ability. Our professional staff will determine the rate of introducing more advanced skills. This will assure our dancers safety within our program. Attempting more advanced skills in early stages of development before physically ready will increase the risk of injury, frustration levels, aid in creating doubt, fear and hesitation and lower self-esteem/confidence. These elements combined will slow and potentially stop the learning process. 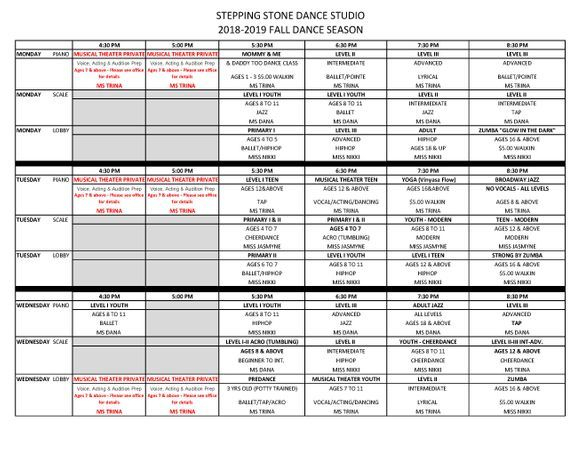 At Stepping Stone Dance Studio we believe in proper training and achieving a skill efficiently and properly before moving forward. DANCERS CAN BE MOVED AT ANY POINT BEFORE THE START OF RECITAL CHOREOGRAPHY, IF SHOWING VAST IMPROVEMENT OR FIT THE CRITERIA FOR A DIFFERENT LEVEL OF ACRO. THIS IS DETERMINED BY THE SSDS TEACHING STAFF. In Musical Theatre, dance movements are combined with acting skills and character interpretation. It incorporates dance and theatre performance techniques. Classes will emphasize rhythm, coordination, strength, flexibility, freedom of movement, acting skills, and character interpretation. This class is designed to gain strength, technique, flexibility and speed. The students learn basic dance terminology and movement phrases that are used specifically for musical theatre training. Students will learn proper warm up techniques and practice absorbing dance combinations to a variety of music styles. Tap class is fun for all ages. The footwork, beginning with simple rhythms and sounds, quickly advances to more complex techniques. Tap vocabulary is emphasized and styles including waltz clog, soft-shoe, Latin, musical theater, jazz-tap, and percussive tap. Tap focuses on musical phrasing and the complexity of rhythms with less emphasis on the visual part and more on the challenge of "making melodies" with the feet. Most often, tap is danced to jazz based music such as Swing, Big Band, Bebop, Funk and Latin styles. The students participate in exercises to strengthen their core (abdominal area); develop leg, back, and foot strength; and stretch to improve their flexibility and elasticity. Adding additional focus on leaps & turns. Beginner class introduces students to the body’s relationship to breath, weight and space through simple steps and movement phrases. Our Intermediate/Adv. Modern class, focuses on space, time, shape and motion. Beginning with a floor warm-up, the class progresses to standing exercises, through longer, more complex combinations that move through space, and concludes with travel across the floor. This class introduces and builds on the basic skills of jazz dance with emphasis on general body technique and development, using classic jazz styles for rhythm awareness and line. Always a popular dance style, jazz utilizes popular dance forms such as hip hop and funk with Broadway and musical theater dance to engage students in a vigorous and challenging class. Dancers also learn the structure of a jazz class, which includes center floor warm-up and technique, stretching, isolations, moving across the floor, and ending with the learned skills applied in a combination. Cheerdance is a high-energy class that will teach you cheerleading motions, stunting, tumbling, how to dance, jump, cheer, kick, and work as a group in formations. Focusing on the spirit of cheerleading, this dance utilizes a combination of jazz and hiphop choreography and technique; with more emphasis placed on the precision and accuracy as a group. We will work on basic technique, learn new skills and put them all together for dance routines. SSDS works with beginner level through high school and all stars. Taking this class will help students get prepared for cheer tryouts and continue to work on skills to progress them to the next level. Students will improve their skills in a safe and supervised environment without pressure while having fun. Lyrical evolved out of Ballet, and it maintains the beauty and rhythmic characteristics that define it, yet it is not confined within the bounds of classical movement. It is unique as it incorporates elements of Ballet, Jazz and Modern Dance to give it a feeling all its own. It is a more poetic way of moving, which evolved as dancers found the need to break away from the rigidity of Classical Ballet and express themselves using a freer style. Lyrical Dance is characterized by telling a story using the dance and the words of a song to express a feeling. Students are taught to express a range of emotions with their bodies, faces and various dance styles. Ballet is the foundation for all dance forms. Classes begin at the barre combining floor barre work with traditional ballet alignment exercises holding on to the barre, and then they progress to center floor combinations. Correct ballet terminology is stressed as is proper alignment, classical technique, and musicality. This style of dance stresses academic technique developed through muscle strength, balance, control, and fluid movements. This class will improve a dancer's strength, rhythm and balance as well as stretch & tone muscles while respecting each individual's flexibility limits. A solid foundation of intermediate to advanced Ballet technique is required for Pointe work. The instructor will determine if a student is technically and physically capable of dancing on Pointe. Ballet class is recommended for all students. Hip Hop is seen primarily on TV during rap and R & B music videos. It is a form that evolved out of street and break dancing moves, and is characterized by its vigorous athletics and bouncy style. Hip Hop is danced primarily to Hip Hop, Rap and R & B music, and knee pads are needed for all levels above basic. It is a high-energy class where coordination, style, and musicality is emphasized as well as street funk and personal style. Combining Creative Movement and the fundamentals of Ballet, Tap & Acrobatics, students develop an appreciation and knowledge of dance. Class etiquette is introduced that will help prepare them for the more advanced classes. Their creativity and interaction are nurtured in movement sessions through circle time, games to music, and utilizing exciting props as they develop their creativity through the elements of dance. Primary Combo Class targets ages 4-7 yrs. Basic dance steps are learned through fun and creative dance, especially designed for their age group. This class encompasses fun learning activities and exercises to spark creativity, imagination, coordination and socialization. Dancers gain poise, grace, self-confidence and discipline of the mind and body. 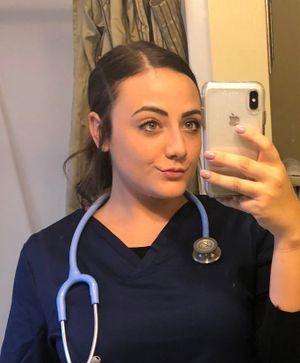 Dance will be a great influence for them throughout their lives and will bring the rewarding and fulfilling experience of pride and accomplishment. These classes are two styles – 30 minutes per style. Broadway Jazz introduces students to theatrical style dancing reminiscent of Tony Award winning choreographers that include Bob Fosse ( Chicago ), Michael Bennett ( A Chorus Line), and Jerome Robbins ( Westside Story ). In addition, the class will reflect the styles of legendary innovators in the art of jazz dance such as Gus Giordanno and Charles Kelley. ◾A preliminary warm-up and stretching for increased flexibility. ◾Combinations that reinforce the technical and artistic components of Broadway Jazz. ◾A study of the works of renowned choreographers to create an appreciation of the American art form of jazz dancing. ◾Simulated Broadway dance auditions to provide valuable insight for those who aspire to dance professionally. ◾Theatrical style dances complemented by music from the award-winning scores that comprise the rich heritage of American Musical Theater.